This luxury-class Catamaran for 16-passenger offers its passengers a choice of eight-, five-and four-day cruises through the archipelago. The itineraries include snorkeling, kayaking and hiking. After the day’s excursions, relax on the sundeck while enjoying a drink from one of the catamaran’s two bars. You’ll rest well in one of the nine pleasant cabins, eight of which have private balconies. All are equipped with private bathrooms, cold/hot water, air conditioning, safe box and other amenities. 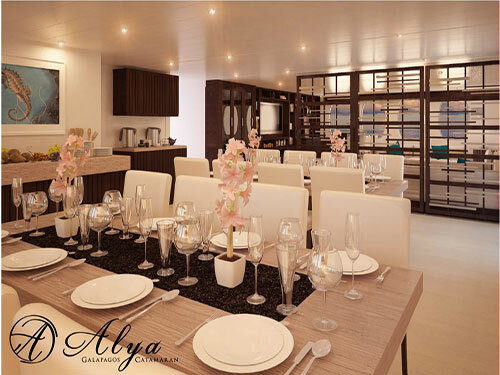 Throughout, the Alia is elegantly and tastefully decorated. 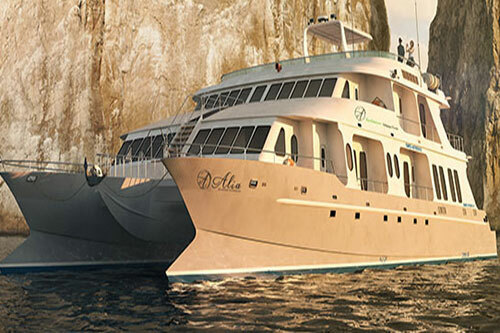 The Alia’s eight crew members and bilingual, certified naturalist guide will assure you a safe and informative journey through the Galapagos Islands.